RS-485 is a single duplex, differential, multi-drop capable serial communications method. 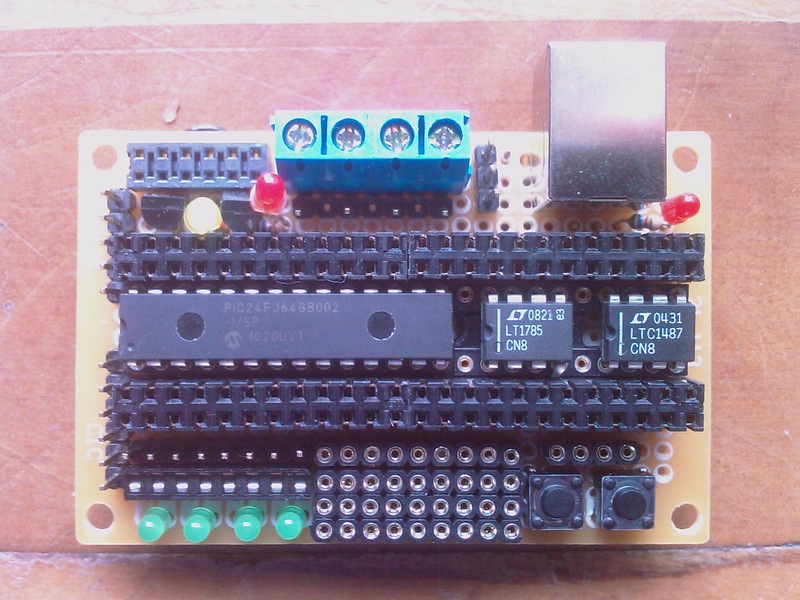 This module has TTL level I/O pin header including 5V, RX, TX, read enable, transmit enable, and ground. Wiring was done above board for self documenting. LEDs are included for the TTL lines. Jumpers are provided to connect a 180 ohm RS-485 termination resistor, source or receive 5V to the RS-485 socket, and whether to tie the read and transmit enable lines together. The RS-485 socket accepts a screw terminal connector (not shown). The voltage regulator is included for translating incoming voltage (7V-20V) to 5V. 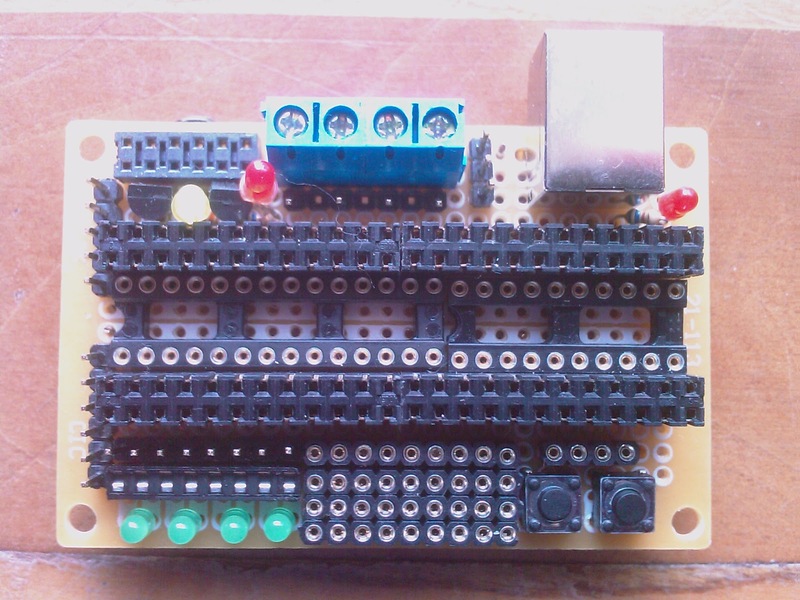 This circuit is built around the Linear Technology RS485 transceiver LT1785. 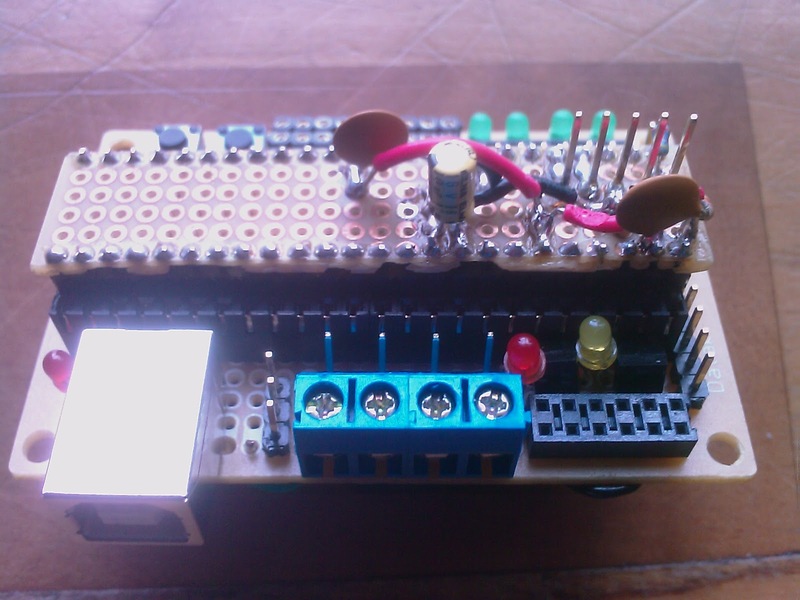 I developed this TTL/RS232 module using a typical MAX232 chip. It is a RS-232 serial communiations transceiver with two transmit and two receive channels. It converts from TTL logic (0V=low, 5V=high) to RS-232 signals (approximately -10V to +10V in this case); see the datasheet for more specifics. 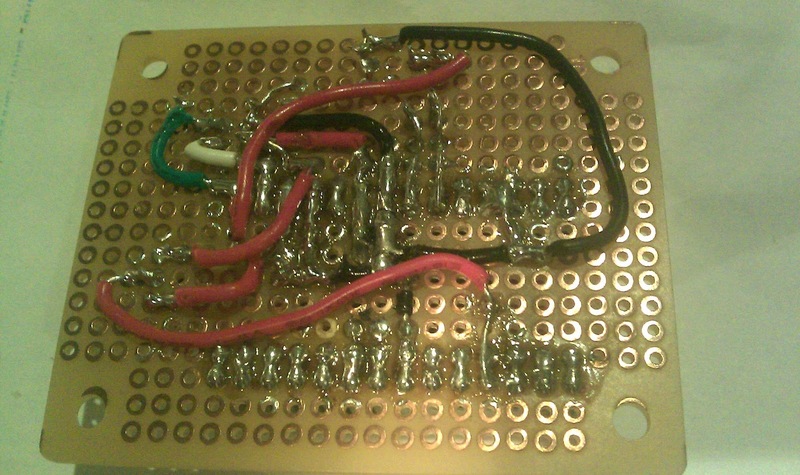 The 6 pin header has 5V, GND, RX, TX, DTR, CTS. The 10 pin header includes all the DB-9 pins, with the DB-9 female connector attached via ribbon cable and socket. 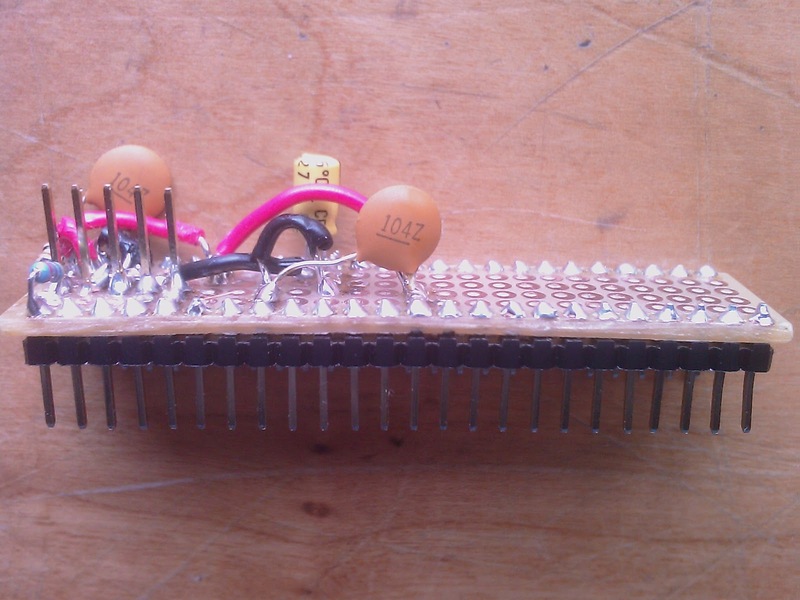 This model of the Maxim chip uses 0.1uF capacitors. I could have used the MAX233 which has is an extra 2 pins wide but doesn't need any added capacitors so is easier to work with.﻿ LEDs are included to show send/receive and cts/rts activity. 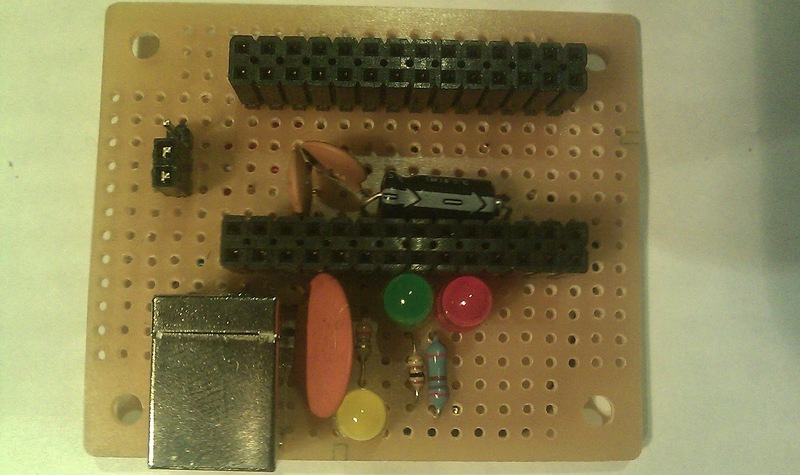 Two of the resistors for the LEDs ended up on the reverse side of the board. WIZnet manufactures chips and modules making it easy to integrate ethernet into an embedded circuit design. This WIZ811MJ model is based on their W5100 chip which has an embedded ethernet stack and is accessible by SPI and parallel microprocessor bus interfaces. 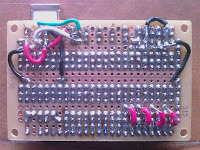 The base module is somewhat daunting with 40 pins. The module I built is the sockets and discrete electronics to breakout only the eight (8) lines necessary for the SPI interface. 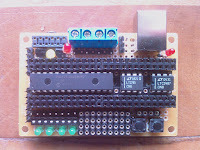 I designed this module in development of a project using GHI Electronic's Panda II. GHI includes drivers for this WIZnet part. Note GHI's Rhino accepts WIZnet's module directly. 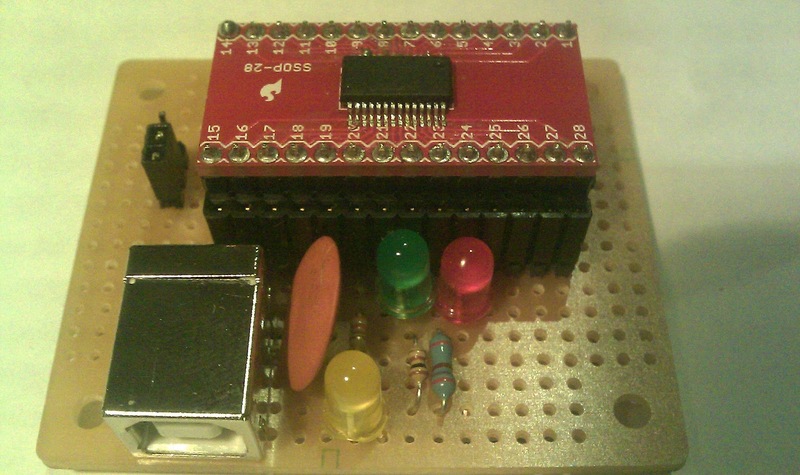 From left to right the pins are GND, SCLK, MISO, MOSI, CS, RESET, INT, and 3V3. The primary advantages of using the WIZnet part is less code and RAM size necessary to maintain an ethernet stack, its low cost, and being accessible via methods that a microprocessor can easily handle. This FT232RL is a popular chip used for converting TTL level serial lines to/from USB serial. You can find it used with Arduino micro cpus and similar. The chip supports any voltage logic. 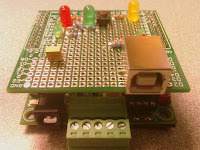 Here it is using 3.3V or 5V logic depending on the jumper setting. A 3.3V regulator is included on chip. I used a breakout board from SparkFun to adapt the 28-pin SSOP to 0.1" pitch headers. This was my first attempt at soldering a surface mount chip. I was successful soldering the important pins. Using dual row header sockets, I was able to construct this as a prototype module, making all pins available for use. LEDs are present for power, RX, and TX. Sample circuits are available in FTDI's datasheet. 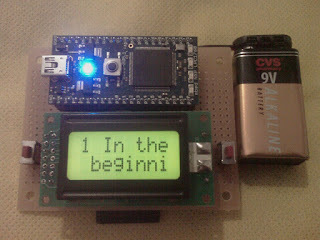 Here is the first RS-485 monitor or adapter I built in small quanity. I started with a RS-485 board from Modtronix, and used their prototype daughter board to add a USB connector (note: required two simple cuts to get USB to work). My firmware for the PIC18F2550 adapts USB serial to RS-485 and vice versa (bidirectional). It bridges the gap between the PC and 9-bit RS-485 protocols. 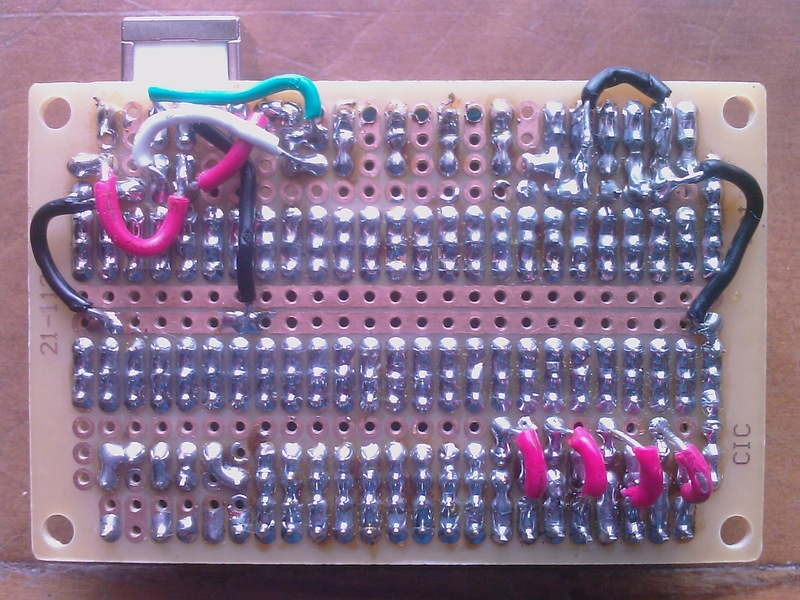 Also, here is a breadboarded version from scratch that uses identical firmware. The RS-485 A/B wires are not show, would leave the LTC1487 chip at pins 6/7. 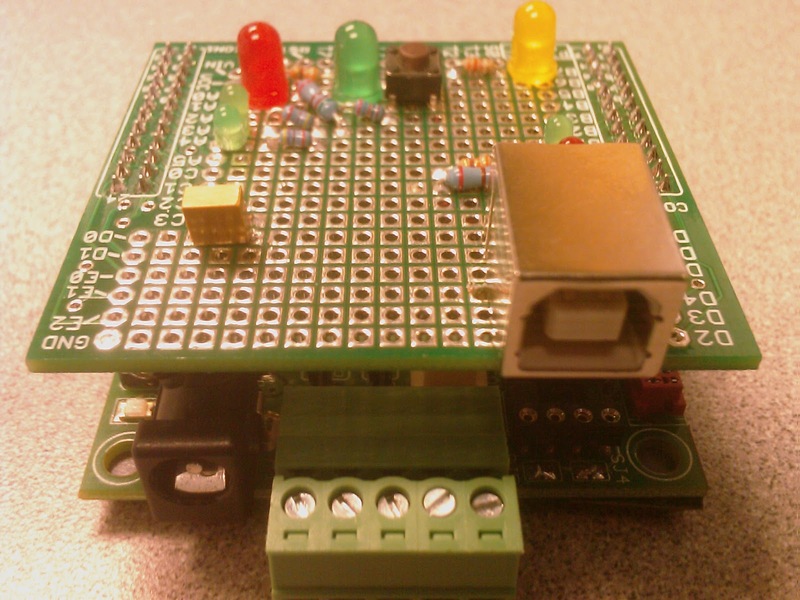 A USB B socket breakout board is used to help prototype the circuit. 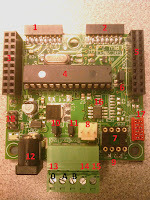 Here is a prototyping board I developed in early 2011. 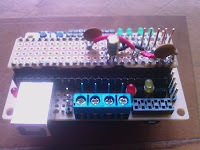 It is a step up from breadboarding in that it has a couple switches, USB connector, LEDs, 3.3V and 5V voltage regulators, power LEDs, screw terminals, and a small breadboarding area. 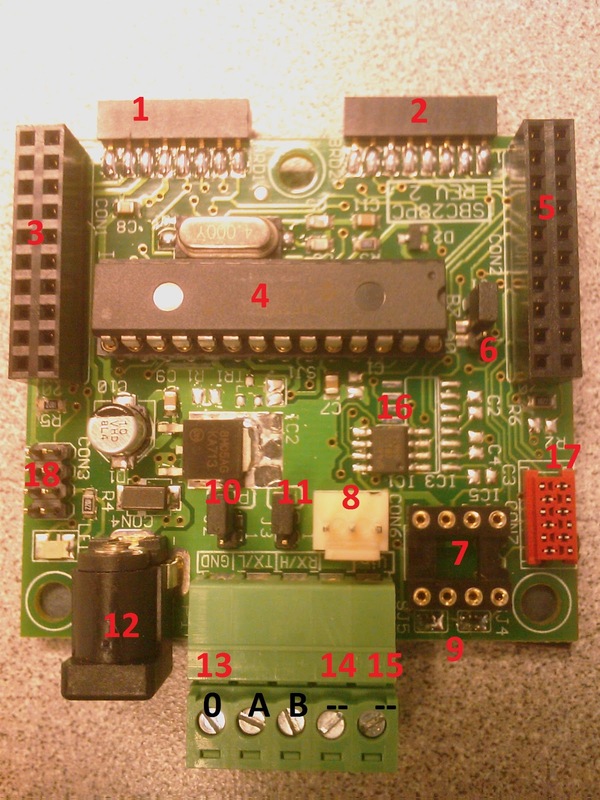 All the components are distinct and not connected to each other except for some ground connections and ground pins. 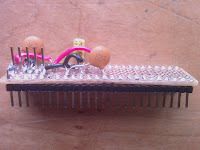 The LEDs have a socket for a resistor array based on the voltage used. This prototype board is agnostic to the chip manufacturer or chip type. The USB connector can be used just for power, or used as a USB device with the right chip. It can fit up to 48 pins of narrow chips. Like the 28 pin PIC18, 28 pin PIC24, 8 pin LTC1785, 16 pin MAX232, etc. Also shown are the underside, PIC24 glue board, and glue board plugged into prototype board. The PIC24 glue board is the only portion that makes it Microchip PIC24 specific. This glue board has all the shared ground and 3V3 connections as well as capacitors and ICSP connector. The result is using up two of the rows of connectors, but relieving a lot of wiring common to PIC24 USB implementations. There's no stopping one from creating other glue boards with other functionality. The original goal of this board in addition to being manufacturer agnostic with some common components, is to be the basis of a PIC24 RS-485 monitor prototype. More on that later.